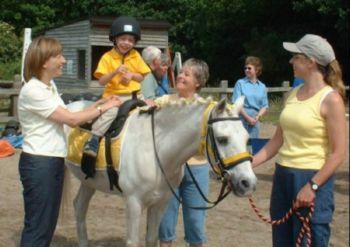 At Riding for the Disabled, our horses and ponies provide therapy, achievement and enjoyment to people with special needs. This local group of the Riding for the Disabled Association was founded in the late 1970’s by Beryl Rae, who named the group after herself and her daughter Sam. Today, the SAMBER group is based at Higher Park Farm, Chobham, allowing children with special needs to ride beautiful horses and ponies, and to receive all the physical and psychological benefits that this entails. Running with approximately 25 regular volunteers, we are able to take children from three local schools who come and share the strength and therapeutic qualities that our equine friends offer in abundance.